we have been working on the lulzbot TK-0. for quite a while now.! it printed pretty well for the first few prints.! the problem which we are facing now is the hotend/nozzle no longer heats up.! when we checked the thermistor connecting wires (2 orange wires) and the heating wires to the wire wound resistance (2 red wires) they were all fine.!! now, towards the end what we figured out was the "heat-0" slot in the RAMBo board was not supplying any voltage of current.! (checked with the help of a multimeter).. WHen we followed the schematics of the circuits of RAMBo heat slots we found that none of the devices in the circuit including the resistors and the led had no voltage between their terminals.! what could be the cause of this malfunction of the heat-0 slot.? It sounds like an issue with the RAMBo board or the power supply. We can replace either/both depending how you want to go about this. If you like, email shop@lulzbot.com and we'll get the process started (or Support will probably just see this on Monday and do so). Sry for the inconvenience. renesis wrote: I had this issue as well. When plugged into the bed heater, the extruder heated up fine. I traced my issue to a blown fuse on the rambo. Once replaced, everything worked as normal. A bit more info here - made an innocent mistake that really has become a bummer! I had the same issue - the hot end stopped heating. I spent a lot of time tracing the heating issue. I recommend that you test for continuity across the fuses before you spend too much time checking wires - I would have saved myself a bunch of time if I had gone there first. The LulzBot team did a great job assembling the printer and, if you were careful not to damage hot end wiring, the components are very robust, so fuses are a likely culprit. I think I blew the fuse when changing the nozzle (this is just a hypothesis). The hot end was active when I attempted to remove the nozzle. The temperature was at 230 C. I pulled the filament from the extruder than removed the nozzle using an adjustable wrench to hold the heater block, and the toolkit wrench to remove the nozzle. Both wrenches were at room temperature. I think the resistor could not keep heat in the nozzle and ended up drawing too much current - blowing the fuse. I may be completely wrong about this - if I am, someone please correct me. As a precaution when changing nozzles, you may want to heat the nozzle, then switch the heat off - maybe this is obvious - being a newbie I had no idea. So, after finding the problem - I was a little dejected to learn I was out of commission until my digi-key fuse order arrived. Order some of the fuses so that you don't have downtime. So, here's the worst part - I went to put the fuse back in the holder and I found that I had damaged the holder by accidentally grabbing the metal of the holder with my needle nose pliers when I initially removed the fuse. I added the fuse holders to my digi-key order! If you have a blown fuse - take your time, grab a flashlight and a thin pair of pliers and make sure you only grab the fuse. I sheared some of the metal off and trashed the holder. I am lucky enough to have a hot-air rework station available to me that I can use to correct issues like this. The fuse holder is a surface mount part that has very little room to apply heat. I have ordered the fuse holders, and additional fuses. Note - the fuses included with the fuse holder are slightly different than the recommended 448 series fuses. The 451 series fuses may be newer. Both are fast acting 5 A fuses. I will try both and let you know how it goes when I repair the board. I repaired my RAMBo - replacing the fuse holders was difficult, but I managed. Back in business. As far as I can tell, the differences between the two fuses (part numbers listed above) is minimal. All systems go again - shame on me! My hot end no longer heats up. I have tested a second hot end and it does not heat up either. Does this mean i only have to purchase those fuses, or is there more to my problem. Will lulzbot replace these fuses without cost? Is there anyway it could be anything else? 1. Is everything plugged in? 1a. ... the power supply to the wall? 1b. ... the printer to the power supply? 1c. ...the power input to the switch, and then to the RAMBo via the 6 pin connector? If you can move the motors, chances are all of these things are ok.
2. Are all the screws on the 6 pin connector tightened, and are there any stray wire strands from one lead that might be causing a short to the other pins on the connector? 3. Are all the screws on the 2 pin connectors for the bed and hotend tightened, and are there any stray wire strands from one lead that may be causing a short to the other pin in the connectors? 4. Does the board output voltage to the bed and/or nozzle heating element? There are 2 LEDs near the output pins that should light up when voltage is applied. You can also set your multimeter to DC voltage and measure the output. If the board does not output voltage, you may have a blown fuse. The fuse is there as a fail-safe, so if it has blown and it's not a faulty fuse, chances are there is some other issue that needs addressing or it will just blow the fuse again. 5. Are the bed/hotend circuit closed or open? They should be neither. the bed thermistor circuit wires are yellow and should read ~100,000 ohms at room temp. You can check these by disconnecting the two-pin connector at the board and reading the resistance across the two pins. If the hotend is not heating and the heating element circuit is reading open, then there is a chance that the heating element is blown. In this case, the 4.7 ohm heat resistor needs replacement. Contact support@lulzbot.com or source your own if you prefer. To prevent this from happening, you can also remove the heating element and wrap it in foil and replace it, or reflash your firmware with a lower voltage being sent to the element (all future 24v TAZ will have this change made in the firmware at the factory as far as I know). If the hotend is not heating and the heating element is reading a short, it is possible that the insulation around the element leads is not seated correctly and the current is flowing through the heater block and not the resistor. 6. Is the problem in the heating element/thermistor itself, or the leads to the heating element/thermistor? Check this by disconnecting the connector near the bed/hotend (two two-pins for the bed, one four-pin for the budaschnozzle) and measuring the resistance there, instead of at the place where it connects to the board. 7. Is there continuity in the leads from the board to the heating element connector? Set your multimeter to ohms and put one terminal on the connector on the board, and the other terminal on the connector near the heating element in question. It should read a small resistance, about the same resistance that is read when the two terminals of the multimeter are touched together -- usually about .1 ohms. 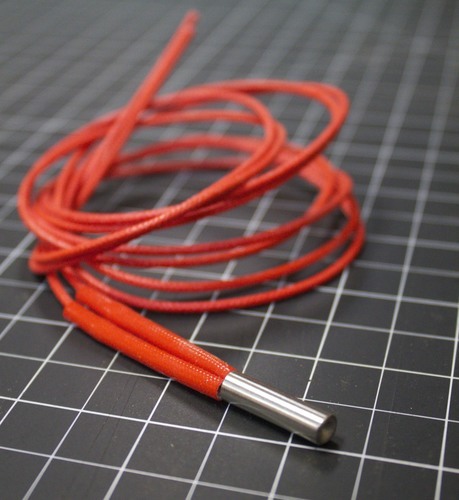 On older iterations of lulzbots, there was no strain relief for the bed or hotend leads, which led to failures due to flexing of the crimps which would loosen over time and open up the circuit. With the newer versions, there is a strain relief, so this failure mode is much less common, but still worth checking if there is not continuity or the correct resistance. You can remove the pins from the connectors by using a pokey thing to bend the retaining tab in and then pulling out the wire and pin for inspection. If everything seems ok, then bend the retaining tab back out a bit and push it back into the connector. Thank a lot for the lengthy response, this will help a lot of people in the long run. Unfortunately, after posting, I found the problem (blond moment ). Due to all the modifications of my PLA fan I've been doing, the quick connects I was using were touching and shorting out the circuit. Soooo for anybody else that has these small fuses go, ask yourself, have you touched the fan recently while the machine is on? It may be due to you fan installation/wiring. Now that I have clean connections with electrical tape I've been good since. Since this is a general, hot-end does not heat up thread, I wanted to say that I had a similar problem. I also ordered the green resistor, but they came in way later than the Tuesday deadline. Shipping and order processing took the better part of a week. Several weeks later, the cartridge heating element still works even though it fit a little loosely, and the hot end heats up much much faster as it is a 40W one. I calculated the resistance on it and it's around 3.7 ohms with current going through it I think. I haven't replaced it with one of the original green resistors. kv1, did you have to make any software change to use the heater cartridge. Also what did you have to solder in place to make this work. This sounds like a better option than using the resistor. FWIW, the heater cartridges are used on the hexagon and e3d all metal hotends... so probably need the TAZ5 or Q12015 firmware.